This year's "The Appliance & Electronics World Expo 2016" or "AWE 2016" is much larger than yesteryear's in its size and operational scale considering the economic downturn in China. Asia's largest home appliance and consumer electronics exposition held in Shanghai, the economic capital of China on March 9-12, 2016, drew over 150,000 visitors from around the world. This year over 20,000 products were on display from some 600 manufacturers from the world. "AWE 2016" covered a combined exhibition area of 100,000 sq. meters. Last year some 550 manufacturers took part in the exposition. Additionally, many firms in the smart field including appliance manufacturers showed their newly launched products and a variety of electronic household goods. "AWE 2016" was characterized by highly competitive and the latest products which were based on people's buying habits and the industrial trends of household appliances. This clearly proved that "AWE 2016" was an excellent choice for the participants to exchange in-depth "smart" information which is the main key word for "AWE 2016." The product categories included consumer electronics, environmental & healthy appliances, smart products, kitchen & bath appliances, white goods, accessories and components. As aforementioned, more than 20,000 top-of-the-line brands were on display during four-day exhibition and a total of more than 150,000 visitors took part in the exhibition, according to the estimate of the host. The Asia's as well as China's largest household appliances exposition, held for four days at Shanghai New International Expo Centre in formerly "Paris of the Orient," attracted the keen attention from both Chinese and foreign news media alike. It was hosted and organized by China Household Electrical Appliances Association (CHEAA). Industrial experts pointed out that the "AWE" in Shanghai has already surpassed the popularity of its counterparts, "CES" in Las Vegas and "IFA" in Berlin, as China has already become the world's largest market for household appliances and consumer electronics. AWE, organized by the China Household Electrical Appliances Association (CHEAA), now has more than 20 year history. AWE, together with CES and IFA, are called the three exhibitions of the global appliance & electronics industry. From South Korea such electronics giants as Samsung and LG took part in this year's exhibition. Last year Korean products included LG's 77-inch curved LED TV and LG's 105-inch ultra HD TV. Other exhibitors included Haier, Midea, Sharp, Bosch, Siemens, Panasonic, Hitachi, Whirlpool, Daewoo, Gree, TCL, Alibaba, JD.com, Hisense, Fotile, Robam, Embraco, Skyworth, Karcher, and iRobot. At this year’s Expo, both upstream and downstream (Mobile Internet, Big Data, Cloud Computing, etc.) firms of smart systems came to the exhibition. They included MIUI, Spotmau, Wulian, GizWits, Broadlink, and many other firms in the smart field. And such appliance manufacturers as Haier and Midea showed the most recent trends of smart homes. Alibaba and JD.com even developed smart showrooms integrating the concept and the reality of smart home in an organic way, so that visitors could have a future smart family life experience. Chinese brand "Haier" displayed a variety of electronic household goods in its spacious room, attracting numerous visitors. "Panasonic," and "AUX," and other foreign brands were equally active in marketing their products at the exhibition venue. "As a representative of China's manufacturing industry, Haier continues to speed up to seek new changes and innovation," Liang Haishan, chairman of Haier Appliance Industry Group said. 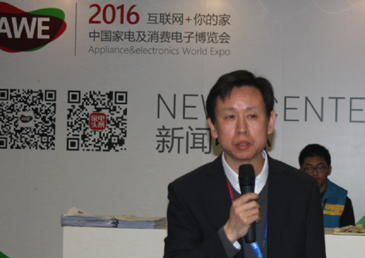 "We are glad to participate at AWE"
"AWE continues to grow and keeps displaying new products from Haier while it encourages and drives innovation in the era of the Internet," he added. "We have cooperated with AWE for three years. I feel AWE has become a veritable comprehensive appliance exhibition with global influence," Lan Ye, CMO of JD Group said. "JD.com is very willing to exchange with more excellent enterprises in-depth and learn from each other through this platform"
"In the future Sharp will provide more products for Chinese consumers," Isao Sakai, president of Sharp Electronics Sales (China) Co. commented. "Sharp will continue to make commodities more suitable to Chinese users and this is why AWE will be our constant choice"
"Samsung made an unprecedented input in this expo with a 700-sq.-meter pavilion, showcasing its latest products, Jin Yon-Tak, president of CE Division of Samsung Electronics China said. "We attracted the attention of the whole industry and Samsung will continue to increase its input as AWE keeps expanding"
Wang Chan, co-founder of Xiaomi, pinpointed that in terms of smart home Xiaomi is already a globalized leading company where millions of dollars are invested on cloud, big data, and also on environment-friendly firms. “We have three core products, they are cellphone, TV, and router, and these are very important products when we talk about smart home," Wang said. "We want everything to be connected in the future and that is our ultimate goal"
Wang went on to say that "However connectivity introduces both opportunities and risks, especially in terms of security." "Every new technology invented should be first applied to mobile phones," Wang argued. "Innovation of mobile phones will never end"
"For Xiaomi, it has invested into dozens of green companies and has already launched air purifier and water dispenser products this year, Wang added. "Every product will be connected to the router and smart home eventually will come on a larger scale"
"Our target is to become No.1 ICT solutions group in China," Shao Yang, vice president of Marketing of Huawei Consumer Business group (BG) said. "We want to make smart home, a new life"
He explained that smart home is a home system based on the home appliances and sensors to be connected through the communication network. "Thus Huawei focuses on connection," he said. "We want to combine PC and tablet to make a smart home as well"
He added that they treat cellphone a "living thing," pointing out importance of adding artificial intelligence (AI) into it. The major characteristics of Huawei this year include two new areas, which are cellphone and tablet. And Huawei plans to promote broadband connectivity for all these products, according to the vice president. Established in 1988 the China Household Electrical Appliances Association (CHEAA) is the host and organizer of "The Appliance & Electronics World Expo" or for its acronym "AWE." Operating under the direction of the governmental National Light Industrial Bureau, CHEAA serves the interests of its member enterprises and protects their legal rights by fostering the development of the household electrical appliances industry. The association serves as a bridge between the government and enterprises or amongst enterprises, managing its industry. It boasts of over 220 members from 24 provinces and municipalities throughout China.